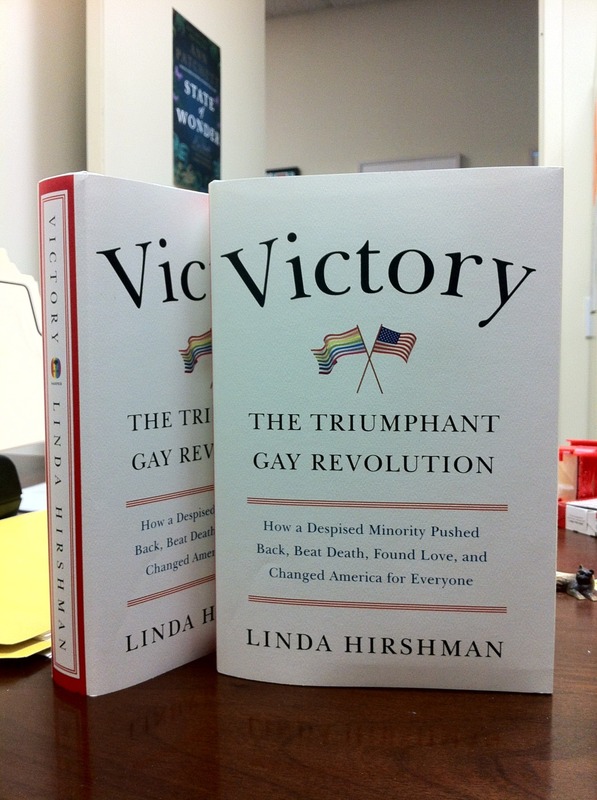 Linda Hirshman authored a book that she entitled Victory, The Triumphant Gay Revolution, How a Despised Minority Pushed Back, Beat Death, Found Love, and Changed America for Everyone. Sound too good to be true? It is too good to be true. Hate crimes have gone up every year from 14% in 2004 to 19% in 2009. Where, then, is this beating of death? Just this morning my friend phoned me that a young teen was sitting on the curb of her nice neighborhood with a busted up face. Some boys in his CHURCH didn’t like his perceived faggotry. We certainly cannot declare that we’ve found love, or changed America. To say such a thing in a book that appears to be “on the side of the homosexuals” is more than misleading. It is dangerous. Victory does raise an important issue. In order for GLBT triumph, American core values of “morality, sanity, and loyalty” have to change. That is something that needs to be said. To say that they have changed is tantamount to abandoning the fight when we most need to stay engaged. Why would anyone do that? The book does give someone without any background in homosexual history an overview. However, for those completely in the dark, the 348 pages of glib-sounding account of homosexuality appear as mainly an urban, male, phenomena. Where are the dykes, the trans, the poor, the rural, and the blacks, the hispanics, the asians? Also there is a class bias in this book. The successful people Hirshman focuses on always move to the right and just want inclusion and their piece of gentrification. They drop the concerns of the marginalized. The drop the concerns of organized labor, or the anti-war movements, or public services. They change from wanting to change America to having a place at the table and a slice of the pie. Then again focus is often on the political arenas. That seems ominous, until you do the math: 1000 divided by 365 is 2.7 per day. More importantly, the fifties is the period of McCarthyism. In light of the math and the context the jump is not so extraordinary after all. Victory is a dangerous book. It is getting a lot of positive press in this election year because it lends credibility to the Democratic party spin that it is a pro-gay and that is reason enough to support them even as there is no real muscle to their rhetoric; nor any real condemnation or attack on Defense of Marriage Act. Before the introductory chapter opens there is a typically flippantly titled section, “Touched By a Fairy”, wherein Arthur Evans “opened his arms and pulled me into a big hug. Still holding me, he explained the sudden onslaught of affection for a heterosexual woman he’d just met a few hours before. ‘You can do this, Linda,” he said. “Tell them our story.” That little bit says more than the entire book on just how wrong this book is. How can we in 2012 assume that a straight woman, one who wonders at the sudden onslaught of affection she interprets in a hug, tell the story of cultures where a hug is perhaps merely a hug. Her predispositions as a straight white woman do color the focus as well as the interpretations in this book. The fact that there is such a media love affair with this book, or how wonderful that a straight women can like the gays so, says more about where the LGBT revolution is than Victory’s claims. Where is the changing of America for Everyone? Is this inclusion in the military, the industries of marriage and divorce, the stamp of approval from the DSMII,I a supporting of difference? Does this book claim an understanding that there is a moral certitude now to be had outside of the nuclear family, indeed outside of moral certitude? Indeed Victory reads more as a tale of the straight world “wrenching” gay people towards straight moral certitude and inclusion in the mainstream. Gay liberation, is celebrated in this book everywhere where it has let go of an agenda, rather than pushed back, everywhere it played ball with politicos and capitalists. This book seems to epitomize the contemporary American dilemma: America accepts the blacks, as long as they are mainstream blacks, like Bill Cosby; lesbians, as long as they don’t look too butch, like Ellen Degeneres. Victory claims that the Gay Revolution changed America. But the book that does not conclude with America’s understanding that love can be non - procreative; that family can be non-nuclear or non-blood or non-state sanctioned can not claim that title. Hirshman’s gay revolution triumph seems rather that the gays have cast themselves in the moral certitude and the desires of mainstream, of white male patriarchy and the attributes of capitalism. Perhaps that is most dangerous of all. For the victims of hate crimes are usually not the successful NYC real estate broker that opens the book. LGBT keep getting discriminated at in the workplace, LGBT youth represent the highest percentage of homeless, queer folk keep getting killed. To call out Victory! now is tantamount to yelling Fire! in a crowded theater. Lives are at stake.